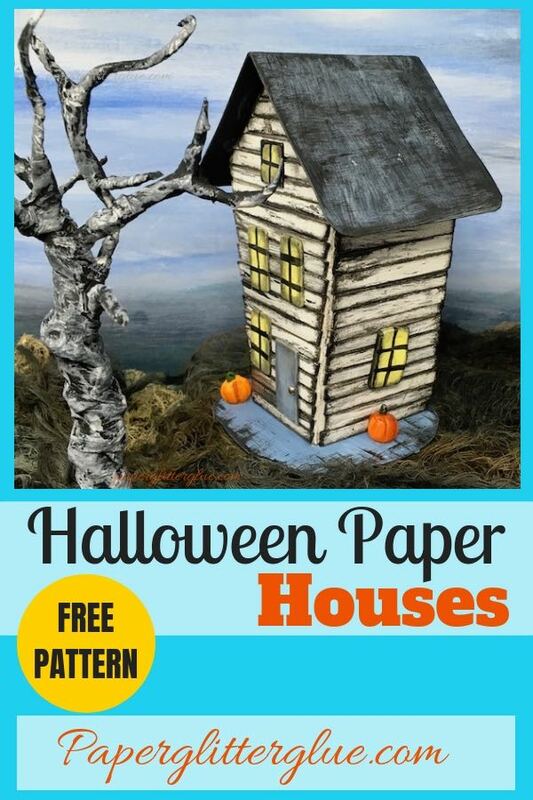 Here is the Halloween Paper House No. 6 – the Crooked Little House. 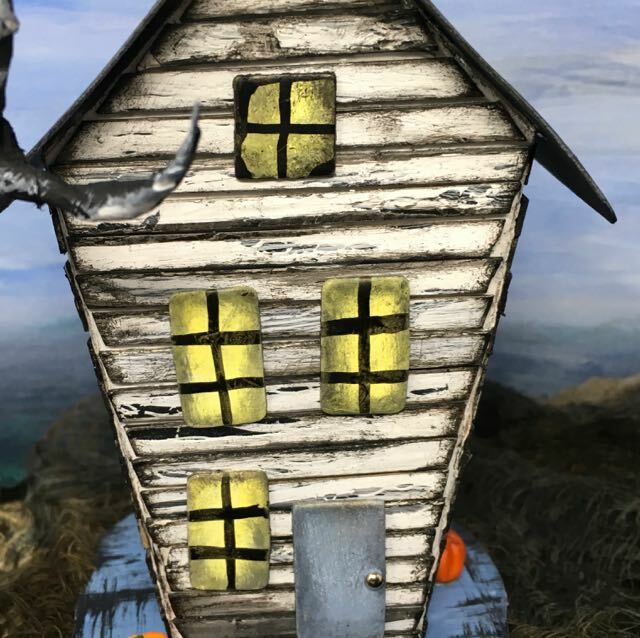 It’s another miniature Halloween house to add to your own Halloween village. 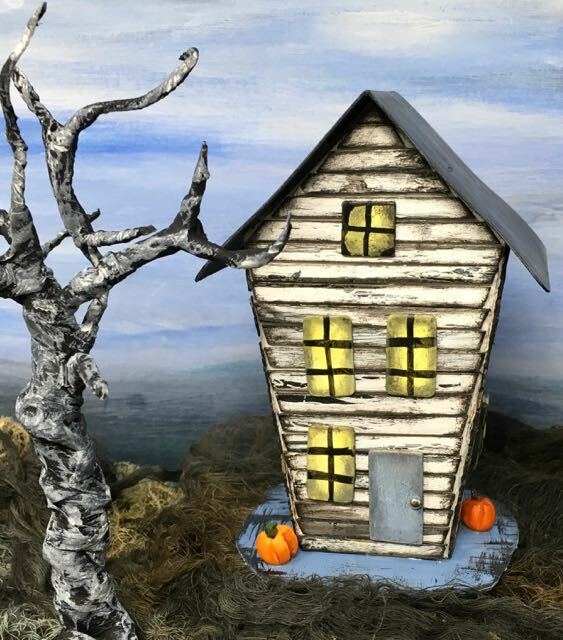 This little paper house has angled sides and distressed crackle paint siding – perfect for Fall or Halloween decor. You can add lots of Halloween features such as little ghosts, bats, a haunted graveyard tombstones, twisted trees, kitties or whatever your imagination comes up with. 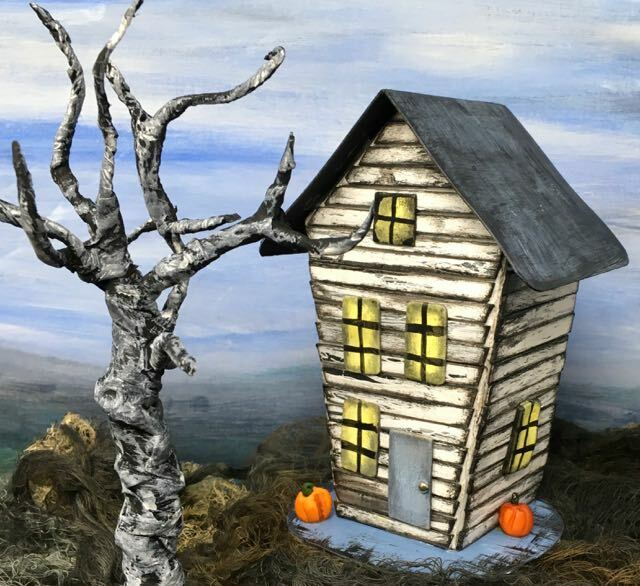 For the 13 Days of Halloween, I have kept the house simple – partly because I am rather busy making and writing about a house a day. This is Halloween house No. 6 in the series. So let’s get started. These instructions are brief because this house is structurally very similar to the previous houses. But when it comes to the crackle paint siding, you’ll get some more detailed information. 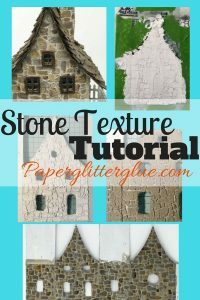 Really it is a very easy house to build, but still a fun addition to your Halloween or Fall village. 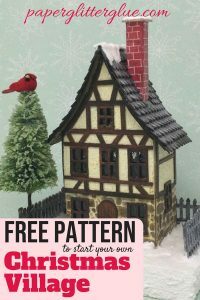 As always, you can find all my free patterns in my Paper Glitter Glue Library. I list the patterns chronologically. 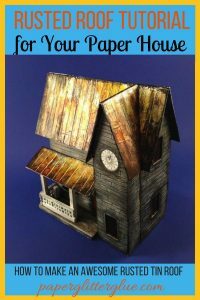 So you will find the newest 13 Days of Halloween paper house pattern first at the top of the library. Please remember that these patterns are for your personal use. Various colors of paint – I use the Tim Holtz Distress Paint line because I love this range of colors so much and they work so well with Halloween stuff. I also use either white or black gesso to prime my houses before I paint them. First download and print the PDF pattern. There is no SVG pattern for this house because I just could not figure out how to make the angled walls accurately. I will fix it sometime, but I don’t think I can do it before Halloween. I am sorry about that if you are counting on me for an SVG pattern for this specific house. Use whatever method works the best for you. For these little houses, I have been making small cardboard base that I just cut out randomly. They don’t need to be anything fancy. In fact, I think irregular works better for this little neighborhood. If you are going to make this house with crackle siding, it helps to use a contrasting color under the strips. Normally I make distressed white crackle siding so I usually paint the base coat black. But guess what? I didn’t here because I didn’t think of using crackle-painted siding until I had already started on the house. It worked fine anyway. To make the crackle siding, first paint a piece of cardboard with the base coat. For this one, I did paint it black. This is the part that will show up between the crackles. It needs to be a strong contrasting color. If you are going to use crackle paint, then just paint that on your cardboard painted with the undercoat. But if you are using crackle medium, you spread that on and then cover it with a top coat of paint. You have to follow the specific directions for each type of paint or medium. Now cut your crackle-painted cardboard into strips. I use a guillotine cutter to do this. Generally I try to cut the strips less than 1/4 inch in width. You’ll see that my strips vary in width. It’s ok – it’s a crookedy Halloween house. That’s my mantra most of the time with these houses. Here’s an important step in my mind. And this is one of the reasons it is so hard to get my hands clean. I edge every single strip with black paint – Black Soot distress paint. It is my favorite. So to hold such little strips I get lots of paint on my fingers. Again that’s ok to my way of thinking. That is, unless I have to go to work that night. Then I really have to scrub. 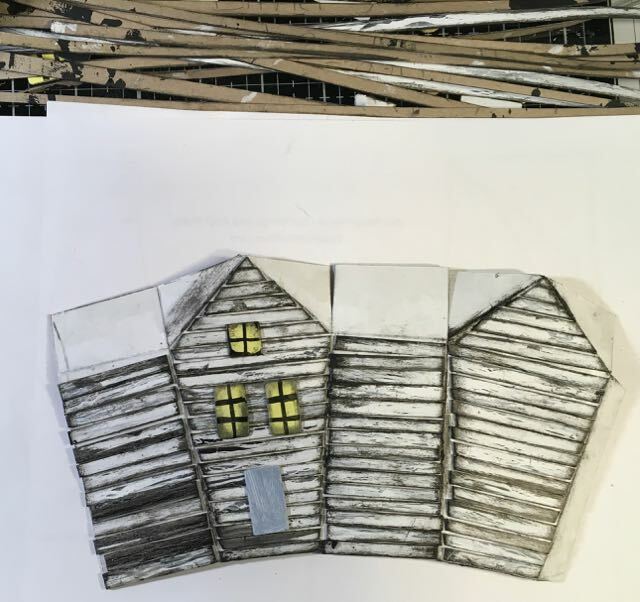 To apply the crackle-painted siding to your miniature house, cut each piece the width of the house. It’s easier on a house with even sides. I didn’t think about that detail when I chose this house for the crackle-painting siding technique. Really it’s not too difficult, but I do cut each strip individually. I think the irregular pattern adds to the charm of the little house. 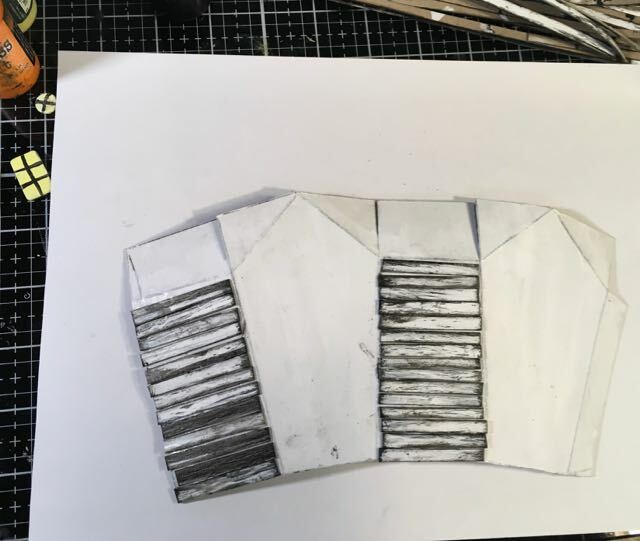 But when you glue the strips to each side, be sure to leave just a little space so that when you glue the house together, the house can fold easily at the corners. Siding applied to each individual side of the house. Finally I have settled on way that I like to make windows and doors for the 13 Days of Halloween series. 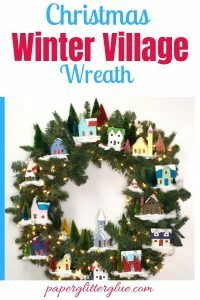 Simply cut out squares and rectangles of cardboard and paint them to match each house. The last 3 houses I’ve done this way look really good. It’s easy and fast and cute. An ideal technique, I think. Oh, and when you add windows and doors, glue them to the side which does not have the glue tab. Plan on having the glue tab in the back. That way the glued seam won’t show up so much. This is where you get to see your work come together when you glue the house together. Glue the glue tab in the back. You probably know by now that I always use a binder clip at the bottom to hold the house together. And most of my house patterns have roof flaps to help stabilize that house and keep it square. It also provides a nice surface for gluing the roof. The glue is drying and the roof is almost ready to be added on the Crooked little house. Paint your cardboard base a contrasting color. Also I’ve been distressing the base a little bit. I just love smearing paint around to distress things. For this step you apply a thick bead of glue to the bottom of the house and adhere it to your base. Let it dry. Finally you get to decorate your little house. I just added a couple of little polymer clay pumpkins that I made last year. You should be much more imaginative than I am. 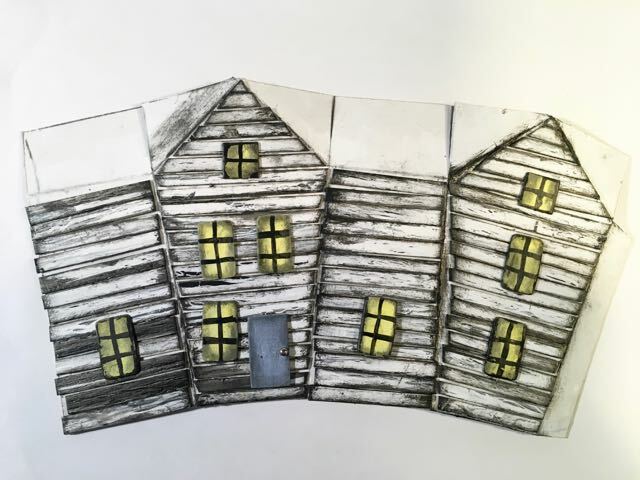 And once again, that’s the little Halloween Paper House of the Day – Day No. 6. 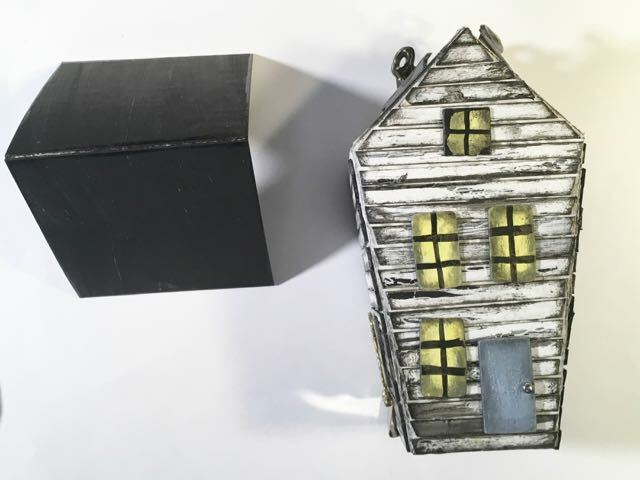 I hope you like the Crooked Little House with its crackle paint siding. Tomorrow, really and truly with be the Triple Gable Gothic House. It has a bit of challenge in the roofline, but I think it is worth it. See you tomorrow. And thank you again for reading. 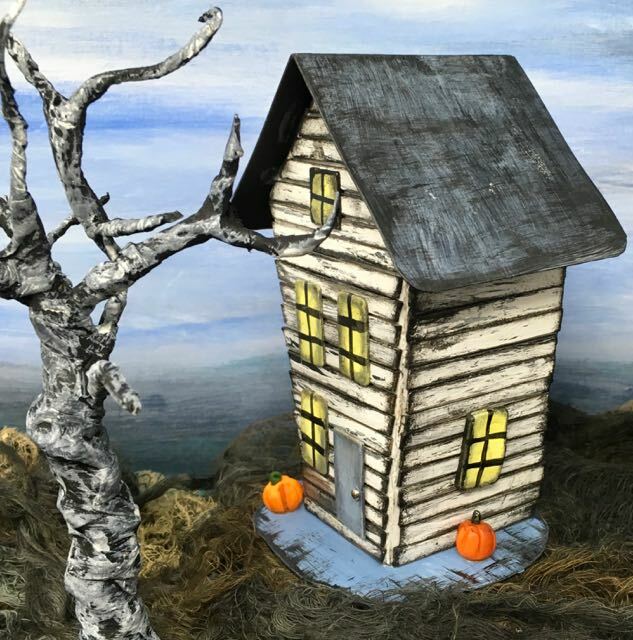 And I am going to be posting these series of Halloween houses on the Simon Says Stamp Monday Challenge blog because the theme is “Halloween/Spooky” perfect for the little houses. You should see the designs that the design team came up with. They are wonderful.